Businesses are in need of competent and credible finance officers that will help them manage and grow their finances. A Chief Financial Officer plays a vital role in the financial management of a company. CFOs are part of the strategic management of the business, which includes economic strategy, financial evaluation, budgeting and forecasting. A Chief Financial Officer should have relevant knowledge, experience and character, to guide your business to get to the next stage. An inexperienced CFO may be detrimental to the direction of your business. Cruz & Co has a depth of experience in businesses of various size and industries. From start ups, to medium sized businesses, companies going through IPO to established large ASX listed companies, our consultants can guide your business to the next level. Industries we have worked in include Retail trade, Wholesalers, Telecommunications & IT, Media, Professional services, Medical practices, Childcare, Finance, Leasing, International operations, Import & Export, Franchised businesses, Merchandising, Legal practices, Building and Construction. Engaging an outsourced CFO can be a cost effective solution for businesses that do not need a full time CFO. 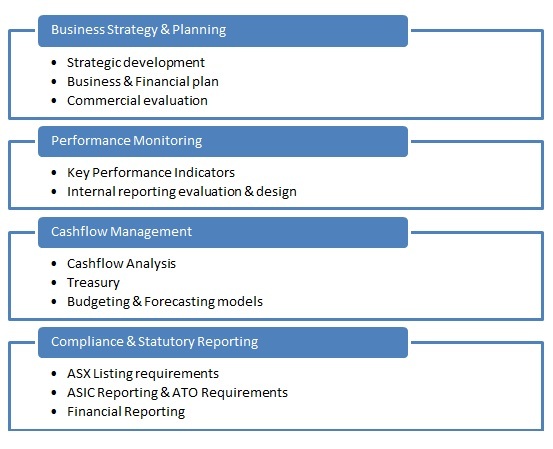 We can provide an opportunity for your businesses to have the experience of a CFO, without committing to employing one.